This is a picture story of life as a volunteer in and around Okada, a tsunami affected area south-east of Sendai. I returned in 2012 after spending time there in 2011. While it is called “a day”, it actually covers several days over the two years. 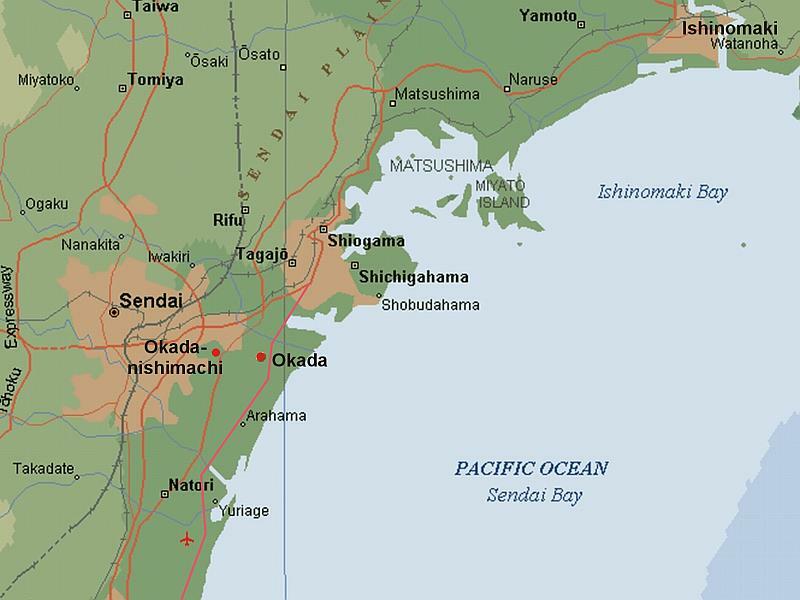 Other sub-pages of my time at Okada can be accessed from the drop-down menu under Tohoku – Life as a Volunteer above or click links below. Okada Volunteer Centre is still operating and has changed a little. Some new staff have arrived, some have moved on and some are still here. A couple more buildings have been added plus covered bike storage area. They also have more vehicles. Today is 6th August, Hiroshima Day, and at the start of the morning talk there is a minute’s silence in memory of the people killed when the world’s first atomic bomb was dropped on that city in 1945. The morning talk is similar, with instructions about general safety and wellbeing. After several times of hearing it I can almost understand what is being said now! The system of allocating work is the same as in 2011, volunteers are separated into groups of 6 to 8 people and taken to their job for the day. It is mid summer and quite hot. It is much dryer than 2011. Once again we are required to wear long sleeves, hats and gumboots, which increases our body temperature. We must take frequent breaks and drink lots of fluids. 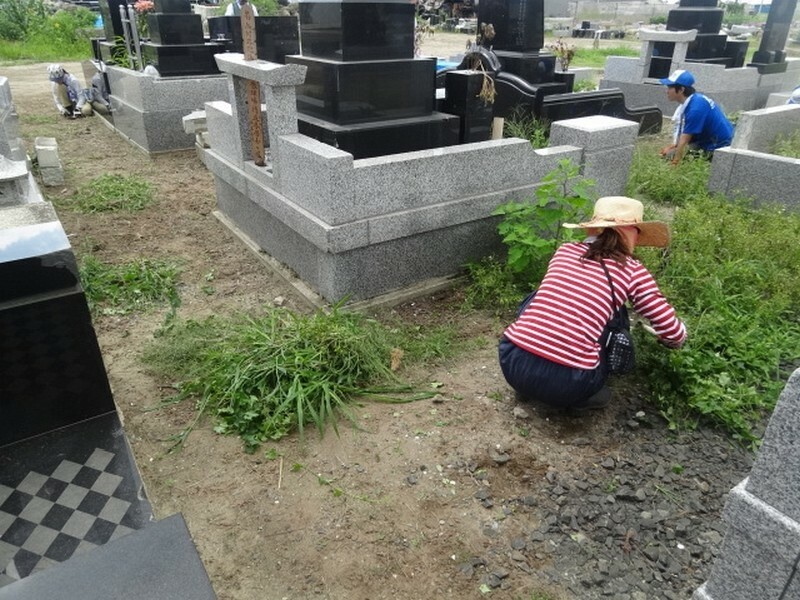 In 2011 the work was mostly to remove weeds, glass and stones from fields; removing silt and mud from houses and drains; cleaning water-damaged photo albums and other odd jobs. That has mostly been done now. 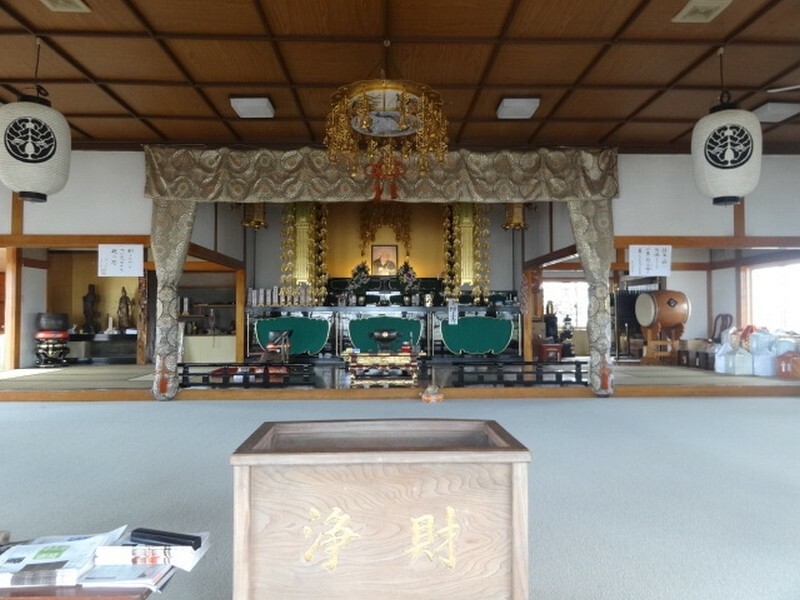 It is coming up to O-bon Festival, when people return to visit their home towns, families and pay respect to their ancestors. This involves visits to graves. 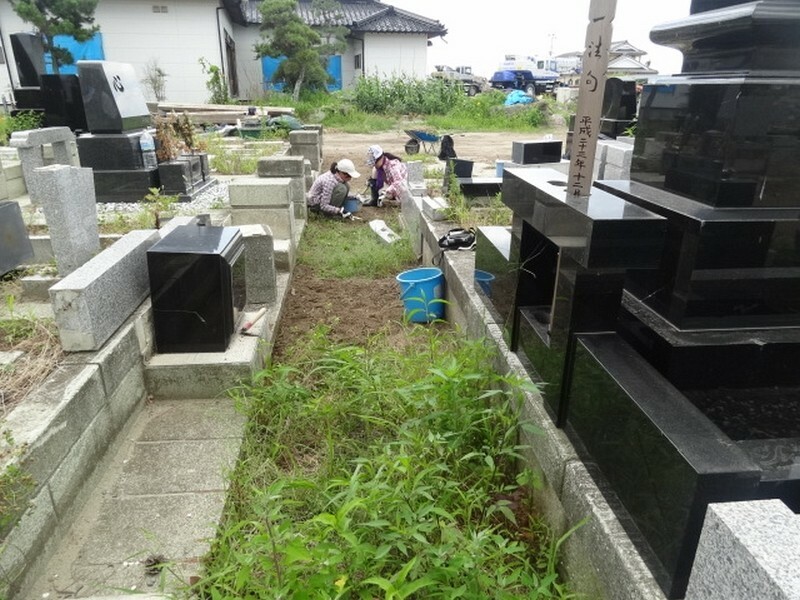 The 照徳寺 Shōtoku tera temple’s cemetery was overgrown and neglected so our job was to tidy it up. 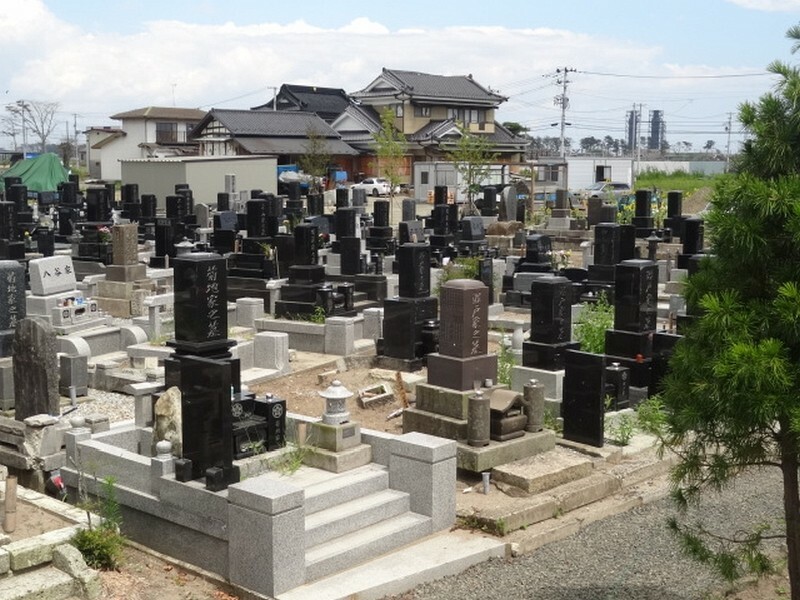 Part of the Shōtoku tera cemetery. At the end we remove boots, gloves and other items of work clothes. 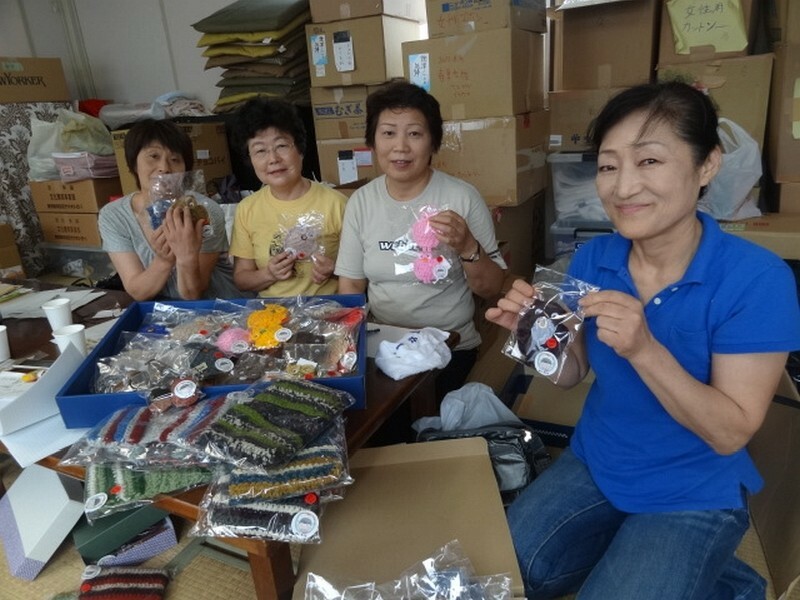 I want to make a special mention of four ladies from nearby Shiogama (an area badly affected by the tsunami) I meet at Okada Volunteer Centre. If I understood correctly, they lost everything and like many others, are now trying to rebuild their lives. They have handmade things to sell at the upcoming summer festival. Even though they have lost everything they want to give me present but I refuse and insist I pay. We negotiate a special deal! I hope things went well and you sold everything!